All over the world, people know the tiny island of Guam as a US territory with a US military base. However, those who have been to Guam know that it is more than that. This US territory is also an island paradise that can rival the best Asian island-resorts such as Phuket, Bali and Boracay. 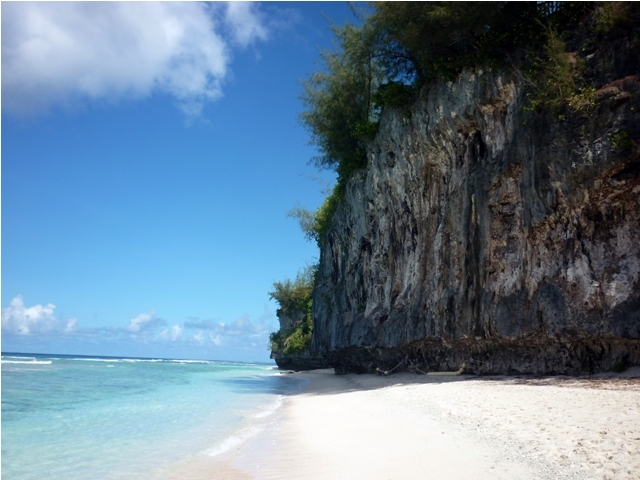 And the most popular white sand beaches in Guam are located in Ritidian Point. Ritidian Point at the northernmost tip of Guam is well-known for two things: (1) pristine sandy beaches and (2) the unspoiled natural beauty as a National Wildlife Refuge. The place used to be a restricted military area, which is why it remains widely untouched. The beaches are practically empty on weekdays, except for a few fishermen plying their trade, which makes the beaches even more inviting than they already are. Local families and a few tourists come on weekends for picnic, swimming or simply to bum around. Nothing compares to its pearly pink-colored sands and crystal clear azure waters. The sand seems to be finer that in other beaches in the island. There are also interesting shells scattered all over the water’s edge. And since it is part of a wildlife refuge, the water is super clean. The currents can be very strong at certain times of the year making it perfect for surfing. In times when the currents are calm, the northern neighboring islands become visible. The beaches are two miles long and are open to the public for picnicking, swimming, fishing and snorkeling. Visitors must take extra caution, though, since there are no lifeguards around. As a National Wildlife Refuge, Ritidian is home to the endangered hawksbill, green sea turtles, and Mariana fruit bats. Ritidian is 772 acres wide with a 371-acre forest and 401-acre marine habitat. A huge 50-acre area is open for public enjoyment and is open from 8:30 AM to 4:00 PM. Visitors enjoy a trek through the lush forest with small and big caves that are filled with interesting stalactites and stalagmites, as well as hieroglyphics and rock paintings done by ancient Chamorros. The trek becomes lovelier with hundreds of butterflies fluttering around. Travelers usually begin the trek by praying to the Chamorro ancestors for blessings and protection. There have been sightings of wild boars and so visitors are advised to take extra caution. The forest is thick, wild and unmanicured. Then, the trek typically ends with a delicious meal along the beach. Visitors, however, must come with packed lunch since there are no convenient stores or restaurants anywhere. As an aside, the Andersen Air Force Base is nearby. Old Vietnam War airplanes and World War II weapons are on display for visitors to enjoy. A visit to Ritidian Point is truly an authentic cultural experience in an untouched island area in the middle of the Pacific Ocean. To get here, travelers must rent a car and drive about 10 miles from the Micronesia Mall. The winding Route 3A leads to Ritidian. It is a long drive through potholed roads, but those who have made this drive say that it is definitely worth it.